Earlier this summer, the United Servicers Association, Long Island, NY, chapter asked me to do a live webinar training for their monthly meeting. They were in a conference room at a hotel in New York while I was in my office in New Hampshire, hosting the webinar from my computer. 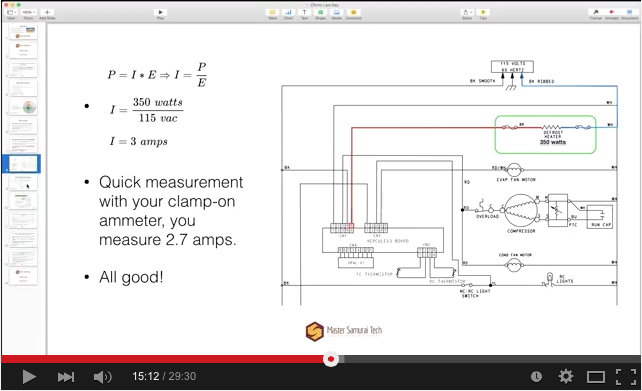 Webinar sessions are an awesome way to provide in-depth training to techs; not only was I able to show and annotate the presentation, but I could answer questions real-time and carry on a discussion. Since my audience was experienced techs, I moved pretty quickly through the material and we covered a lot of ground in one evening. The four major topics were: 1) the basics of electricity; 2) series and parallel circuits; 3) Ohm’s Law; and 4) understanding and reading schematics. All of these topics and more are taught in our online Fundamentals of Appliance Repair training course. I unpack this much more thoroughly in my presentations in the Fundamentals of Appliance Repair training course. If you or your technicians would like more in depth learning on these topics, check out the Fundamentals course. We offer online, comprehensive, up-to-date, technical training for appliance technicians in the 21st century! Samurai Tech Academy Fundamentals Students: FREE! The Samurai Tech Academy announces upcoming webinars as well as course updates, new course offerings, and special discounts in the STA newsletter. If you'd like to subscribe, you can do so here. 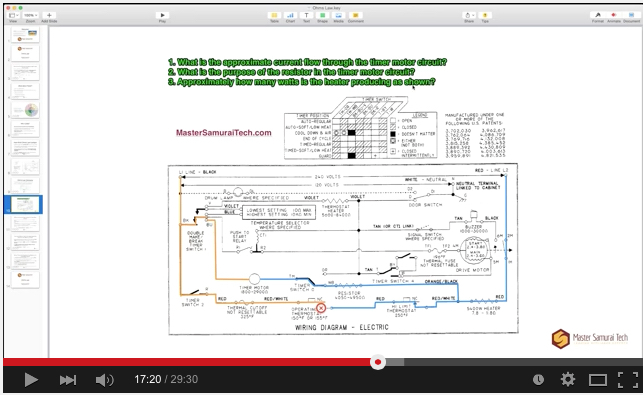 A Master Samurai Tech Presentation: What is Electricity? This is just a small sample of what we teach in the Fundamentals of Appliance Repair training course. We go into great detail in a series of self-paced lessons explaining basic electricity, circuits, schematics, troubleshooting, motors, and much more! Enroll today!